Dell' imprese die Scipion Bargagli … Alla prima parte, la seconda, e la terza nucoamente aggiunte. Venice, Francesco de Franceschi, 1594. Small 4to (20.5 x 15 cm). 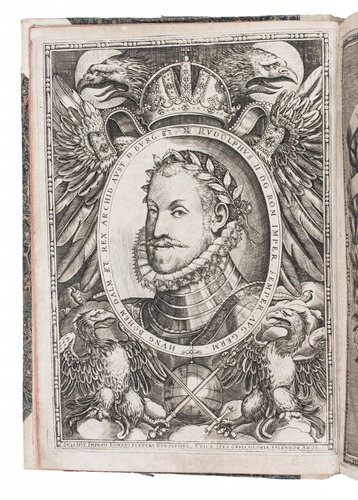 With oval engraved device on title-page, full-page engraved portrait of Rudolf II, full-page engraved dedicatory emblem, and 138 engraved oval emblems in text. 19th-century half sheepskin parchment. 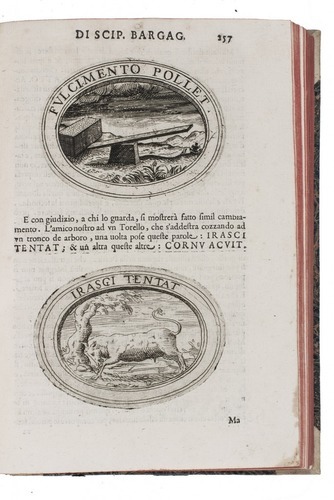 First complete edition of an important study of emblems, combining theory with (illustrated) examples, by Scipione Bargagli (1540-1612), "one of the chief authorities on devices" (Praz). 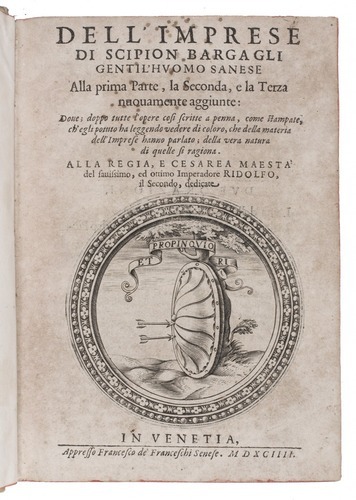 The first part was first published in 1578 and republished in 1589, while the second and third parts appear here for the first time. 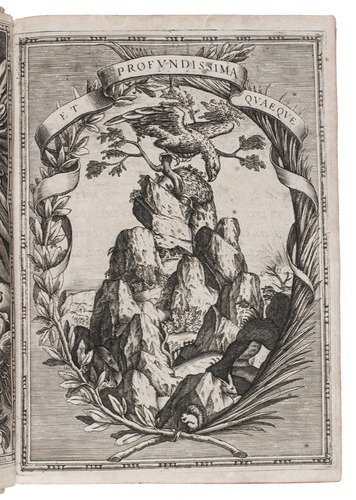 It is presented as a dialogue between Scipione himself, Belisario Bulgarini and Ippolito Agostino, who engage with other theorists such as Girolamo Ruscelli and Paolo Giovio. Of special interest is the lengthy treatment of emblems composed or commissioned by women. 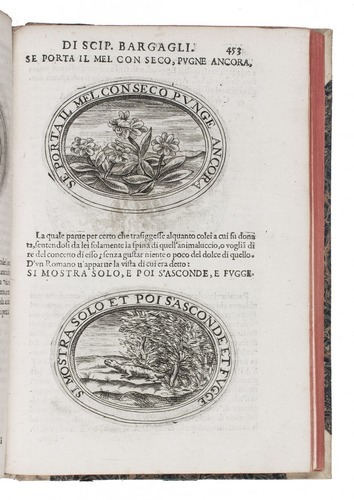 Preliminaries browned, a few leaves slightly foxed, a tiny whole in the foot margin of one leaf (affecting part of the catchword) and a smudge obscuring several letters in the main text, otherwise in very good condition. 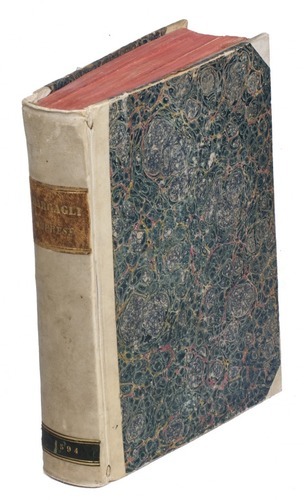 Binding also very good. 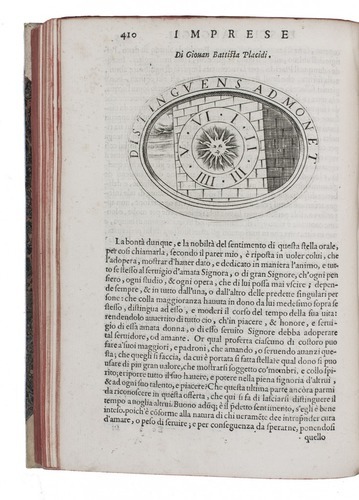 Chatelain 45; ICCU 016869; Landwehr, Romanic emblem books 142; Praz, p. 266, cf. 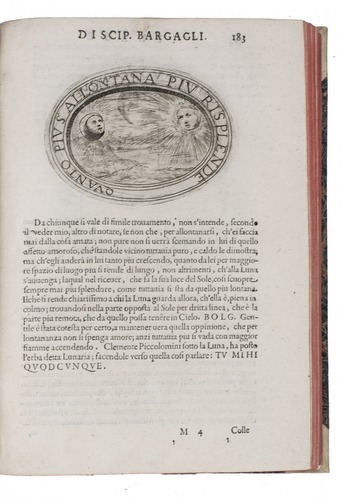 p. 68; cf. G.W. 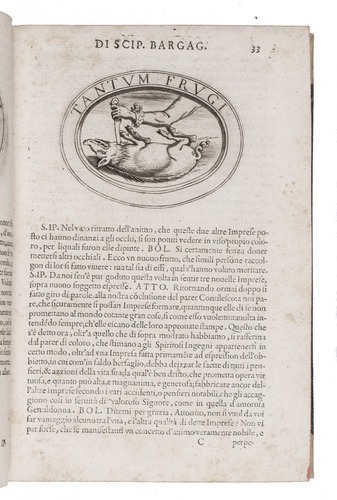 McClure, Parlour games and the public life of women in Renaissance Italy.